A Japanese probe sent to examine an asteroid to shed light on the origins of the solar system is expected to land on the rock later this month, officials said Wednesday. The Japan Aerospace Exploration Agency (JAXA) said that the Hayabusa2 probe is expected to touch the asteroid Ryugu at 8 a.m. local time on February 22. "The landing point is decided and it is confirmed how we are going to land, so we want to do everything possible to achieve it without making mistakes," JAXA project manager Yuichi Tsuda told reporters. The announcement comes after the agency in October delayed grounding for several months and said they needed more time to prepare for the landing, as the latest data showed that the surface of the asteroid was more resistant than expected. In October, JAXA successfully landed a new 10 kilogram (22 pound) observation robot known as MASCOT: "Scout mobile surface asteroid". Loaded with sensors, the robot can take images in multiple wavelengths, investigate minerals with a microscope, measure the temperature of the surface and measure magnetic fields. Hayabusa2, about the size of a large refrigerator and equipped with solar panels, is the successor to JAXA's first asteroid explorer, Hayabusa, which is Japanese for the hawk. The Hayabusa2 mission, which costs about 30 billion yen ($ 260 million), was launched in December 2014 and will return to Earth with its samples in 2020. The photos of Ryugu, which means "Dragon's Palace" in Japanese, a castle at the bottom of the ocean in an ancient Japanese tale, show a trumpet shaped asteroid with a rough surface. By collecting samples of it, scientists hope to answer some fundamental questions about life and the universe, even if the elements of space helped bring the Earth to life. 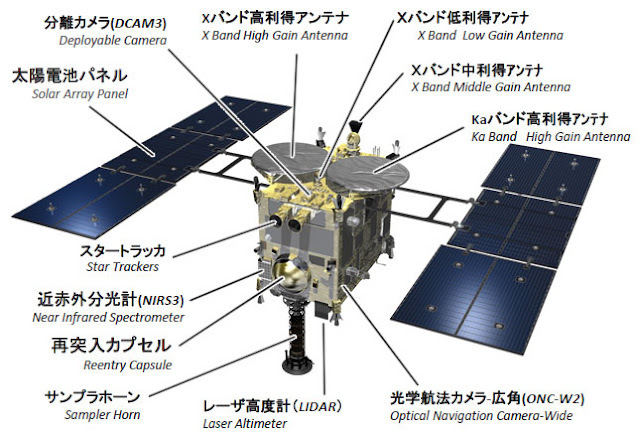 0 on: "The Japanese probe Hayabusa2 will land on an asteroid on February 22"